On the road with the Titan of all trucks. 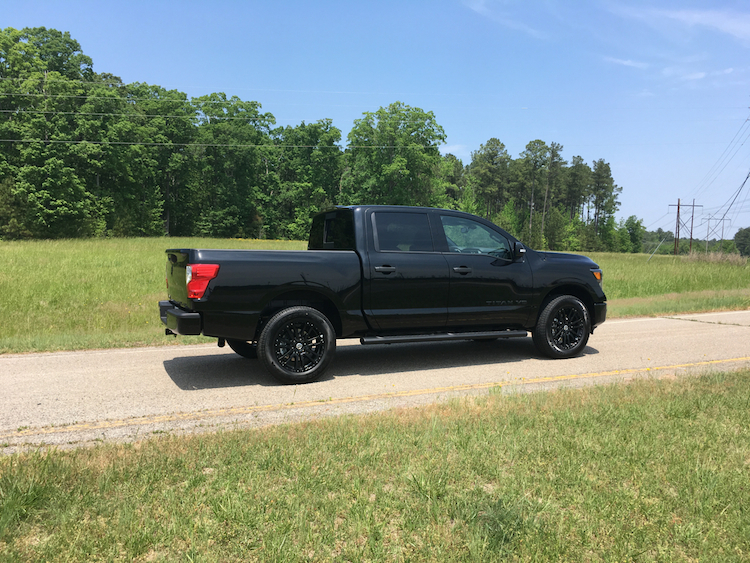 2018 Nissan Titan Crew Cab SL Midnight Edtion. Pickup trucks are the meat of the auto industry, supplying the profits manufacturers need to shore up their operations. This fact is much more pertinent to the traditional US truck manufacturers — GM, Ford and Fiat Chrysler — than to competitors such as Nissan, Toyota and Honda. Indeed, all three traditional Japanese companies have done well with cars and their respective luxury brands, but they also must supply pickup trucks to meet customer demand. Nissan has two offerings in the mix: its midsize Frontier and full-size Titan/Titan XD. The latter pair fulfills most of the models customers want. Like Toyota, Nissan still leaves the heavy-duty market to the Big Three, with maximum tow ratings and dual axles among them. The Nissan Titan rolled out in 2004 and was the first full-size Japanese pickup truck capable of taking on the Chevrolet Silverado, Ford F-150, GMC Sierra and the Dodge Ram 1500. Initially, demand was strong, although sales never approached Detroit levels. Nissan kept with this model for 12 long years, with sales bottoming out at 12,140 units in 2015 — less than one-seventh of the peak number attained in 2005. Fortunately, two new models were in the planning stages, beginning with the 2016 Titan XD, a vehicle occupying the white space between light- and heavy-duty pickup trucks and the 2017 Titan, the official replacement for the first-generation model. Nissan did not offer a 2016 Titan. The 2018 Nissan Titan delivers a few changes, including an all-new King Cab, joining the previous Crew and Single Cab models. A few appearance packages are new too, including the Midnight Edition on my test Titan Crew Cab SL model. Nissan offers the 2018 Titan with standard rear-wheel drive (4×2) and available four-wheel drive (4×4) configurations. The bed length availability varies by cab length. Nissan supplies one powertrain choice: a V8 engine paired with an automatic transmission. As I have covered this model and the Titan XD extensively before — here, here and here — this time we will drill down and review some of the finer points about Nissan’s largest model. As you might imagine, there is a wealth of details of interest to pickup truck shoppers. While the first-generation Nissan Titan offered extended (King) and Crew Cab configurations, it lacked a Single Cab option. It was not a big deal for most shoppers as only a small number opt for regular cab models anyway. Still, to be considered a serious player in this business, offering all three means Nissan has something for everyone. 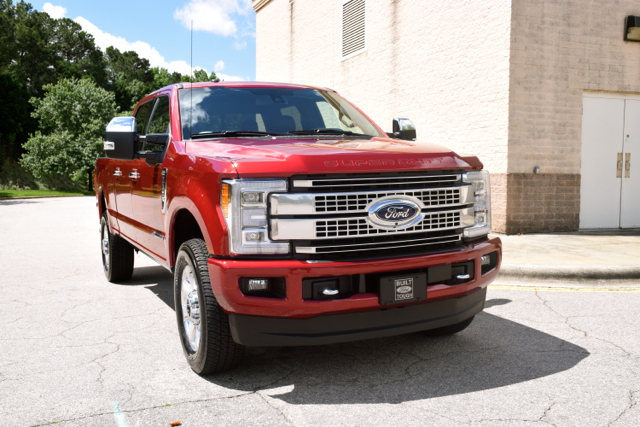 The single cab offers a three-place bench seat, the King Cab has bucket seats up front and a three-place bench seat in the rear (although the rear seat can be deleted), while the Crew Cab matches the King Cab and delivers more cabin room to go with it. 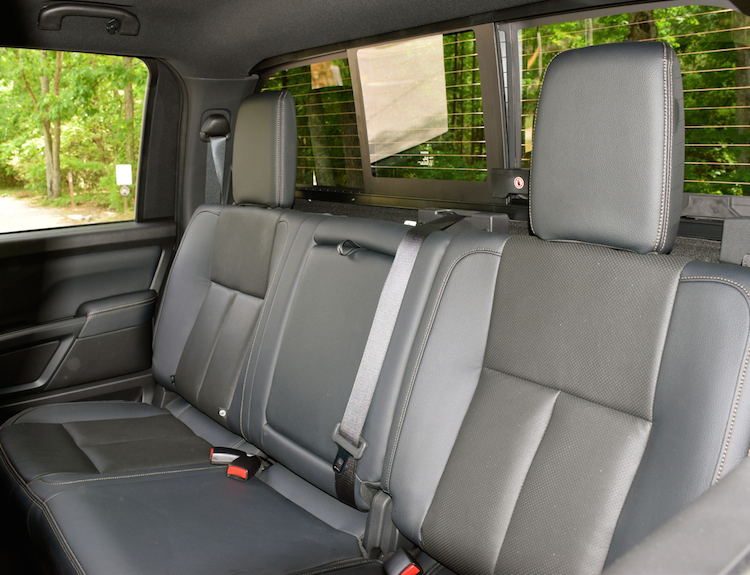 Naturally, the Crew Cab is the roomiest of them all, delivering large knobs, big storage areas and lots of room to maneuver. If you are making the move from a competing brand, you will find the Titan matches up nicely with the best. 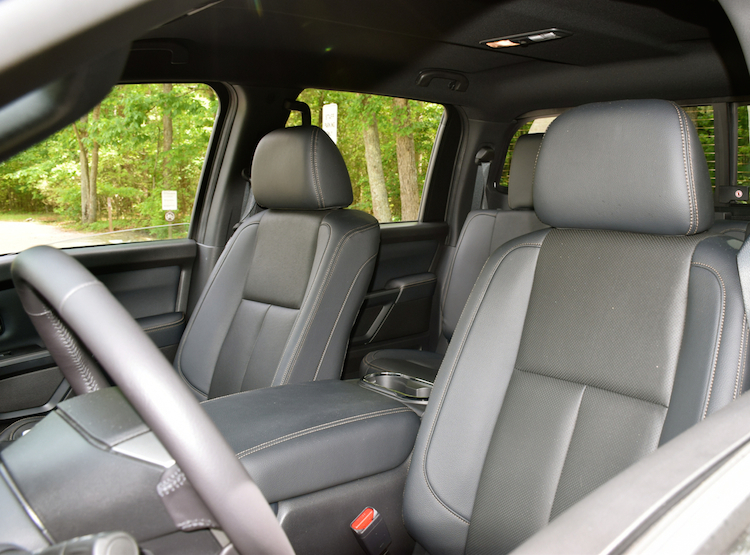 It stops short of some of the excess offered (here is looking at you, F-150 Platinum), but you can get leather, heated seats and a heated steering wheel. Most Nissan products offer upwards of four trims. With the Titan, you have five: S, SV, PRO-4X, SL and Platinum Reserve. On SV and SL models, you can layer the Midnight Edition trim, but only on Crew Cab Models. The Midnight Edition is new this year, advancing a now common “blacked out” look found on special editions of most full-size pickup trucks. 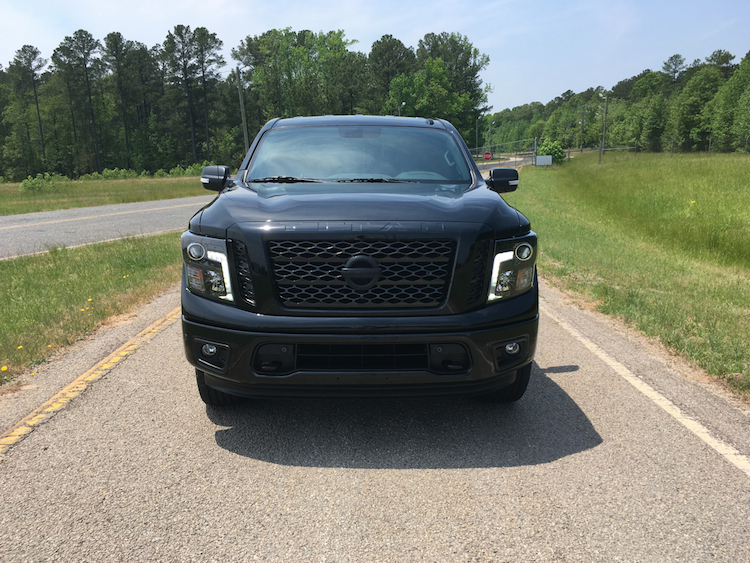 Here, you will find a body-color grille with dark insert, dark headlamps, black fog lamp finisher, black exterior badging, black mirrors and door handles, 20-inch black wheels, body color front and rear bumpers, black step rails and a dark charcoal interior trim. The ME supplies an aggressive look, although some may find it too overpowering for their tastes. 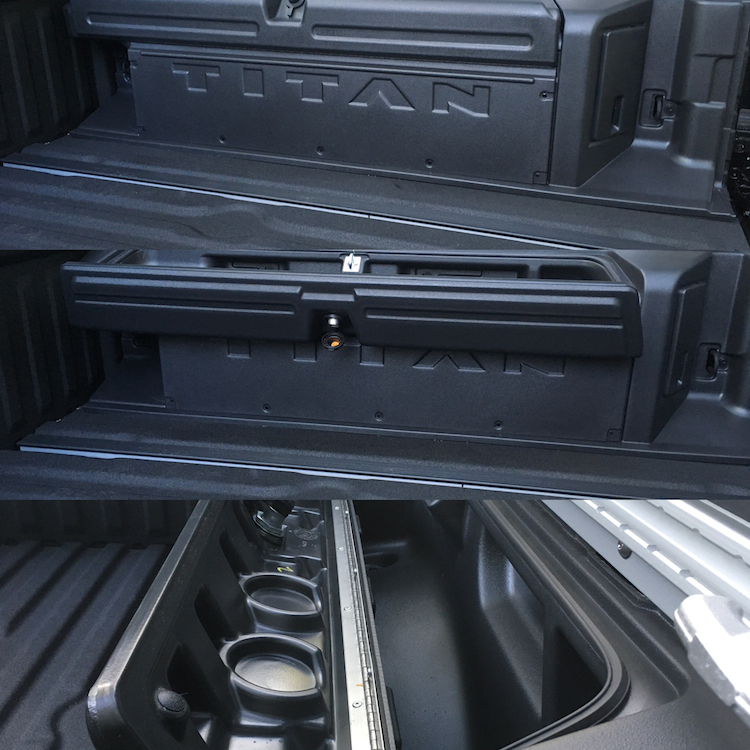 I generally avoid recommending the base model for any vehicle and that holds true for the 2018 Titan. The base model lacks the chrome exterior trim, available satellite radio and trailer sway control common to this segment. Therefore the SV is a good place to start, with the SL offering perhaps the best bang for the buck. That said, expect your sticker price to approach $50,000 for a Crew Cab four-wheel drive model. Discounts are available, so educate yourself about the current offers. Choose a full-size pickup truck and you will find a powerful engine paired with a capable transmission. Nissan keeps things simple by offering just one powertrain combination: a 5.6-liter V8 engine with 390 horsepower and 394 pound-feet of torque. A seven-speed automatic transmission routes power to the wheels. This combination delivers the performance you need, moving the Titan a long at a steady clip. Of course, this model weighs nearly three tons, so the engine must be up to the task. We have been waiting for Nissan to sign off on a V6 engine for the Titan, but it has not happened yet. Likely, it will be most suitable for lighter duty applications, but we shall see. Nissan makes it easy to dial in four-wheel drive, with the expected high and low ranges available. The one thing about taking the Titan off-road is that this truck is so darn big! It can handle light and moderate off-road work just fine, but if you intend to punish it, then opting for the PRO-4X version equipped with all-terrain tires, Bilstein shocks, and an electronic locking rear differential with the included active brake limited slip (ABLS, what senses wheelspin and brakes accordingly) is the best course of action. Payload and towing are important numbers for any pickup truck. 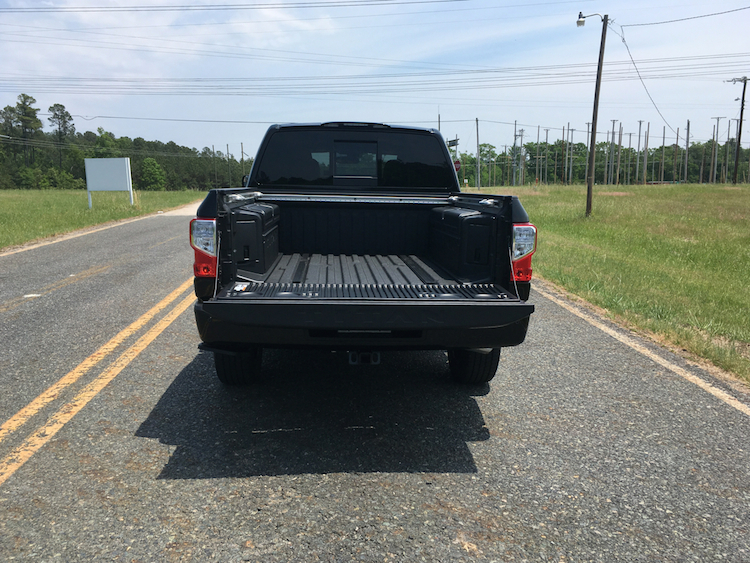 When it comes to the full-size Titan, the big numbers are where you expect to find them: with the Single Cab. The Single Cab delivers a payload rating of 1,940 pounds (1,950 with 4WD) and towing of 9,740 pounds (9,470 with 4WD). King Cab payload numbers are 1,600/1,630 pounds and towing comes in at 9,400/9,240 pounds. With the Crew Cab, your numbers are 1,590/1,610 pounds for payload and 9,400/9,230 pounds for towing. Customers expect at least a 1,500-pound payload limit and trailering of at least 8,000 pounds with their big trucks. Happily, the 2018 Titan gets the job done. As a side note, if you need payload pushing 3,000 pounds and towing of about six tons, the Titan XD is your better choice. What is the Nissan Titan’s weakest link? Surely, all manufacturers have one. In this case, I found the infotainment interface disappointing. Ram and GM offer much better and easier to use systems; Ford has come along way with its SYNC interface. Toyota is perhaps the weakest of all, especially with its available Scout GPS directions app. That app is not dependable as our family has learned with our 2017 RAV4. As for the model at hand, the screen is smaller than what we like and has a dated appearance. The standard screen measures five inches, while the available larger screen measures seven inches. You still cannot have Apple CarPlay or Android Auto smartphone compatibility and there is just one USB port at the ready. The standard six-speaker audio system is what you would expect to find in a pickup truck. The available 12-speaker Rockford Fosgate package turns things up nicely. Bluetooth is standard and a 110-volt power outlet is an option. Navigation is another option. All models have a rearview monitor and you can get blind spot warning with rear cross-traffic alert. The optional Titan boxes are located on inside of the cab. Both boxes holds dozens of drinks and ice. A drain on the bottom lets water out. So, where does the Nissan Titan stand in a highly competitive segment? In some areas, the Titan is in the thick of things with its powerful V8 engine. Its transmission, however, now trails some models, including Ford with its 10-speed automatic. Moreover, if you want a different engine choice, you are out of luck. Toyota offers two V8 engine choices, while the US competitors have as many as five options for consumers, including a turbo-diesel. The Cummins diesel in the XD might work here, but it is geared toward power, not efficiency. Notably, Ford, GM and Ram each offer a 3.0-liter turbo-diesel V6 engine available with highway mileage approaching 30 mpg. Although the Titan gets it done in most areas, it trails the top competitors. That fact might not matter much with Nissan faithful, but it makes it nearly impossible for Nissan to poach shoppers from the Big Three. 2018 Nissan Titan photos copyright Auto Trends Magazine. All rights reserved. A look at the year-to-date best-sellers through June 2017.
significant contributor to overall Ford F-Series sales. The US auto market is slowing down and will most likely finish below 2016’s peak numbers. Still, somewhere between 16.8 and 17 million new passenger vehicles will likely sell as the books close in early January — that’s still an impressive range. To that end, let’s take a look at America’s current crop of the 10 best-selling cars, trucks, and SUVs, with statistics supplied by GOOD CAR BAD CAR and confirmed by the manufacturers. 1. Ford F Series (429,860) —- Ford’s full-size pickup trucks are right where you expect them to be: on top. Indeed, for four consecutive decades the F-150 and similar models have led the pickup truck sales pack. In many years, this truck has been the best-selling passenger vehicle, bar none. Year-to-date (YTD) sales are up 8.8 percent for a model last redesigned in 2015 (2017 for Super Duty models). 2. Chevrolet Silverado (262,940) —- The Chevy Silverado has long been in second place behind the Ford F-150. However, in some years the Silverado and its GMC Sierra twin outsell Ford, allowing GM to claim the full-size truck crown. This year, sales are down 3.9 percent for a model last overhauled in 2014. A new model is about two years away and it can’t come soon enough as Ram may move ahead of Chevrolet for the first time. strong sales for this aspiring model line. 3. Ram Pickup (250,443) -— That the three top selling models in the US market are full-size pickup trucks may surprise some, but given how strong this segment is, the hold these three have isn’t. What is surprising is that Ram sales are up 7 percent, demonstrating that demand for a model redesigned in 2009 and renamed in 2011 continues unabated. A new model is due out in 2019. 4. Nissan Rogue (195,689) -— The biggest gainer this year among the top models is the Nissan Rogue. Now comprised of Rogue and a smaller Rogue Sport model, sales are up a whopping 31.4 percent. 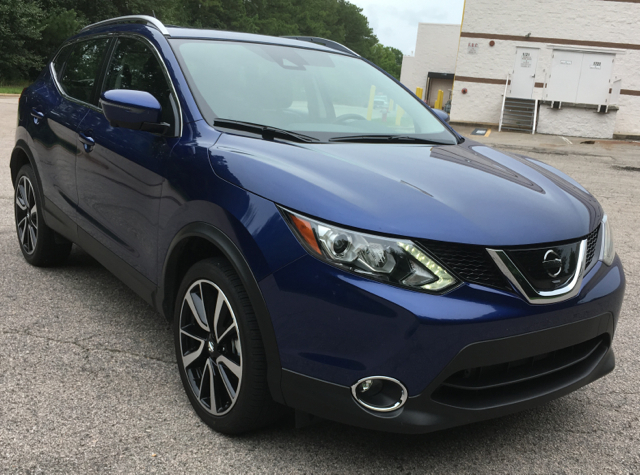 Redesigned in 2014, the Nissan Rogue continues to harness insatiable demand for small SUVs and they’re doing it with just one powertrain choice — a 2.5-liter four-cylinder engine comes paired with a continuously variable automatic transmission. 5. Honda CR-V (187,726) —- Honda’s Accord and Civic models have long delivered a 1-2 punch for the automaker, but since CR-V sales began to surge five years ago, it’s now a 1-2-3 hit from Honda. The CR-V is now in the top position, benefiting from a 17.7 percent sales surge YTD. Helping matters is a 2017 overhaul, what makes this model one of the newest in the small SUV segment. 6. Toyota RAV4 (184,766) —- Like Honda, Toyota has also enjoyed a 1-2-3 punch. Like Honda, the compact RAV4 SUV has leaped the Camry and Corolla, and is now Toyota’s top-selling model. 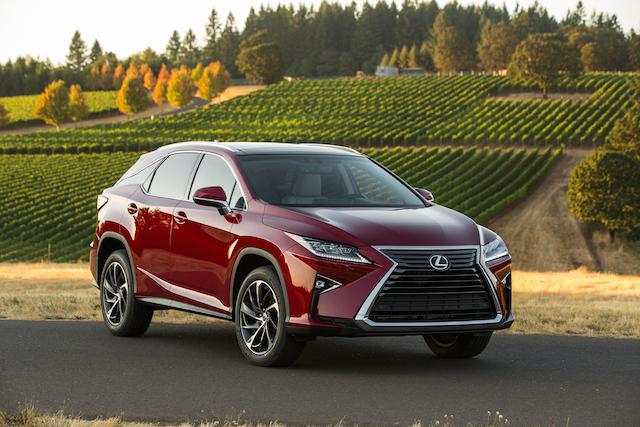 Up 11.4 percent YTD, the RAV4 is one of three compact SUVs that may outsell the Camry this year, the perennial best-selling car in America for most of the past two decades. to reclaim its top perch once again this year? 7. Toyota Camry (176,897) — Whoa! Toyota Camry sales are down 11.4 percent YTD and that doesn’t bode well for America’s top-selling car. Consumer tastes have shifted and cars are getting hammered. But there is hope — an all-new Camry is in production and some type of rebound is certain to follow. Whether that’ll be enough to close the near 20,000-unit gap between the Camry and the top-selling Rogue is not knowable. 8. Toyota Corolla (176,527) —- The Corolla was last overhauled in 2014. But like the Camry, sales are taking a hit, falling 7.7 percent so far this year. Unlike the Camry, a new model isn’t waiting in the wings. At least not this year. 9. Honda Civic (175,763) —- Honda shook the small car market in 2016 when a larger and more dazzling Civic made its debut. But sales are down 7.4 percent YTD as a once forgiving market reveals a harsh reality: even handsome cars can’t keep up with SUVs. 10. Honda Accord (160,091) — The only car to challenge the Toyota Camry in recent years has been the Honda Accord. 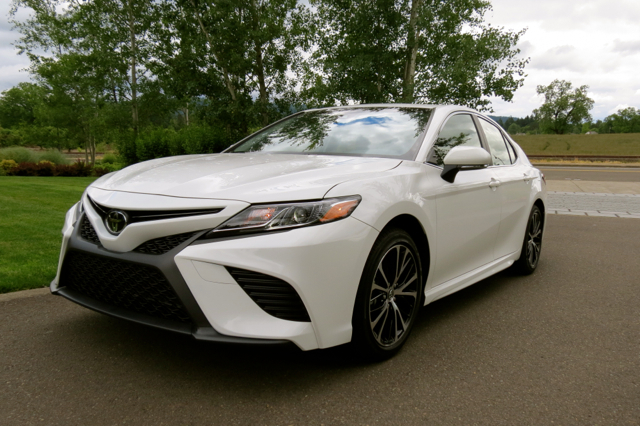 Like the Camry, sales are down YTD and to the tune of 5.5 percent. Also, like the Camry, a new model arrives this year, bringing with it the possibility of a sales rebound before the year closes out. The current top 10 may change before the year draws to an end. The Ford Escape occupies eleventh place, just 4,000 units behind the Accord. The twelfth through fifteenth positions include the Nissan Altima, Ford Explorer, Chevrolet Equinox, and the Jeep Grand Cherokee. Of these four, the all-new Equinox has the best chance of moving up as the year winds down. Photos copyright Auto Trends Magazine unless otherwise noted. All rights reserved.